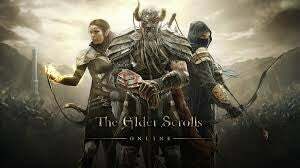 So any O-Deckers playing Elder Scrolls Online or going to be playing it on the 4th, if you didn't get early access pre-order? If not why not? Whats the matter, someone steal your sweetroll? If so lets share User IDs and be friends to the end! Mine is, better write this down, IraeNicole. My main, and only character so far, is an Altmer Sorceress in the Ebonheart Pact. If you friend me and your User ID is unrecognizable to your O-Deck name please let me know who you are. I played through most of the Betas so I got pretty much what I was expecting and I have really been enjoying it. Pleasantly surprised at how few bugs there are compared to the Beta. There are still bugs but if I couldn't handle those, at release or otherwise, I wouldn't be a Elder Scrolls and Fallout fan. Only server issue I have had so far was last night as it got busier was that I got randomly dropped every now and then from the game. But I was able to log in immediately after each time. The quests are so much more fun then what I remember from WoW and feel like Elder Scrolls game quests. There are always fun little things I find all over the place. I have mostly been playing solo which works well 90% of the time and when it doesn't I work together with other people who are in same area doing similar quests, no need to even form a group unless we want to. Vary rarely do you really have to group up with others but I teamed up with my roommate for some stuff and that made things go even more smoothly. There are always fun little things I find all over the place. Like two runaways arguing on the side of the road cause they couldn't even light a campfire and saying they should just give up and go back home. Then I lit the fire and they thanked me and sat down to relax next to it. Or the lady I found later wanting donations for I have no idea what. I gave her the money, wasn't much. My roommate couldn't see her though. I kind of wonder if either of these are going to come back later. Which kind of brings me to my biggest things I like about the game. Localization and choices. I am a quest person so that is kinda what I focus on. The game gives you quests every now and then that have choices to the outcome. I think it is always just two choices but can't be absolutely sure. The choices effect the world around and peoples attitudes. I had the choice of coming to the aid of two locations and when I later went to the place I didn't pick, I found it corpse strewn and carrion birds overhead. I haven't gotten that far in the game so can't say whether they do or not, but the game would be wasting huge opportunities if they do not have farther reaching consequences to choices beyond the immediate ones. I hope there will be follow up quests to some of these later. Localization is amazing and it should be everywhere. I love seeing real world results to my actions. Even single player ES games didn't really have it that much. Doing some quests to save a keep full of people from ghosts and then, after you break the curse, finding all the ghosts are gone or friendly from on and people are going about their daily lives again? Super satisfying. I think this has gotten common in MMOs but I don't really remember it being a part of WoW when I played pre-Burning Crusade. Even map markers change to reflect your progress. I run to a farm and find out it is under seige by goblins. On the map when I open it up and mouse over the location and it says that below the name. I go through a series of quests to drive them off and save the family members. I look at the map again and it says how I drove off the goblins and saved the people. As I work my way through the map I leave behind a trail of heroic deeds that gives me warm an fuzzies when I scroll through it. There is a main quest to the game which so far is like playing a single player Elder Scrolls. That seems weird but interesting for an MMO. I haven't gone through it enough to say to much on how it works out. The quest line starts with your standard Elder Scrolls prison break game opener and later get a follow up at level 10 so I assume you get more and more as you level up. Oops, I rambled on and on. Anyways post your thoughts, considerations, condenmnations, and come-ons below!